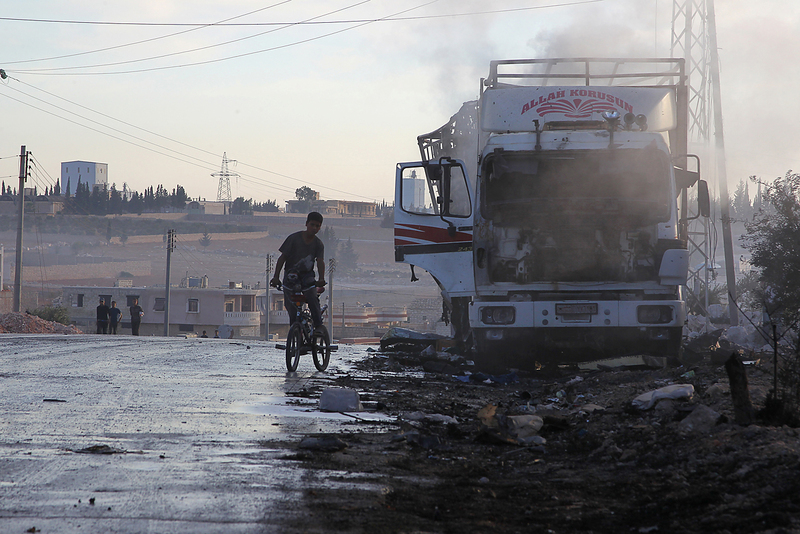 A boy rides a bicycle near a damaged aid truck after an airstrike on the rebel held Urm al-Kubra town, western Aleppo city, Syria, on Sept. 20, 2016. Russian experts believe that the latest incidents in Syria, which have seen the fragile ceasefire agreement fall apart, may transform the conflict into a proxy war between Russia and the U.S. The ceasefire in Syria that Russian and American diplomats had only been able to establish after many months of painstaking negotiations has been broken only a few days after taking hold. On Sept. 19 a UN humanitarian convoy on its way to relieve a rebel-held part of Aleppo came under air attack. According to preliminary information, 21 people died as a result of the bombing, which wiped out 18 trucks full of food. A UN spokesperson said the convoy’s route had been provided to all parties in the conflict and was clearly marked. On the evening of Sept. 19 the U.S. retaliated by accusing Moscow and Damascus of war crimes, pointing out that they were the only two players in Syria who could have bombed the UN humanitarian convoy. U.S. State Department spokesman John Kirby stated that Washington is "outraged" about this incident, complaining that the Syrian regime had obstructed attempts to deliver aid to desperate citizens for more than a week, and when permission had finally been granted, the convoy had been attacked. "The Assad government and the Russian Federation knew about the convoy's route. UN mission workers were killed for their attempts to help the Syrian people," said Kirby, who added that as a consequence of the strike the U.S. will reconsider its relations with Russia. The Russian Defense Ministry denies the involvement of Russia's air force in the strike on the UN convoy. It says that according to information provided by Russia's air reconnaissance, on Sept. 19 Al Nusra Front militants began an advance on Aleppo in the area in which the UN convoy was moving. "We attentively studied the video footage recorded by the so-called ‘activists’ in the location and did not find any signs of ammunition striking the convoy. Everything shown in the video footage is the direct result of a fire that oddly occurred at the same time that the militants began their large-scale advance on Aleppo," explained Russian Defense Ministry spokesman Major General Igor Konashenkov. Just a few days earlier tensions had risen after the U.S. air force mistakenly bombed Syrian government army positions in Deir el-Zour, leaving 62 people dead and over 100 wounded. Commenting on the incident in Deir el-Zour, Russian Interior Ministry Spokeswoman Maria Zakharova stated that Moscow had come to a “really horrible conclusion” following the air strikes: “The White House is protecting Islamic State,” she said. The military personnel and political analysts interviewed by RBTH believe that Russia and the U.S. will now act in Syria in the ways that they individually think best. Russian and U.S. cooperation in Syria was initially built on very deep distrust towards each other, noted Fyodor Lukyanov, editor-in-chief of Russia in Global Politics. "In order to obtain results in such conditions basically you need to sign a contract. It must contain precise descriptions of the participants' actions, guarantees that the obligations will be carried out and the consequences of unimplemented actions. Moscow and Washington did not create such a contract," said Lukyanov. In his opinion, military action will now be renewed in the region and events will unfold according to one of two scenarios. "Russia and the U.S. will again try to find points of convergence and sit down at the negotiating table, something that is very unlikely after the incident with the UN convoy. Or the events, to our horror, may lead to a proxy war in Syria," added Lukyanov. He believes that Russia and the U.S. may start to act against each other through their sponsored parties in the country, and in the worst-case scenario Russia and the U.S. may even begin a direct conflict with each other in the region. Military expert and deputy director of the Institute for CIS Countries Vladimir Yevseyev thinks that Russia's future actions in the region will be determined by its military cooperation with Turkey. After the visit by Russia’s chief of staff General Valery Gerasimov to Turkey on Sept. 15 Ankara announced that it was expanding its participation in the Syrian conflict. "The matter concerns joint coordination of combat activities. It began through special communication channels and is being ‘transferred’ to the battlefield. Perhaps later we will see interactivity in the battles for Aleppo," said Yevseyev.